Malivelihood is a Nigerian UK-based jeweler who is widely known for crafting diamond encrusted necklace for most Nigerian celebrities like the likes of Davido, Huspuppi but to mention a few. The over-joyed singer and one time signee to G-worldwide quickly took to his social media platform to call out the young in heart Vado citizen for deeming it necessary to return his lost necklace. 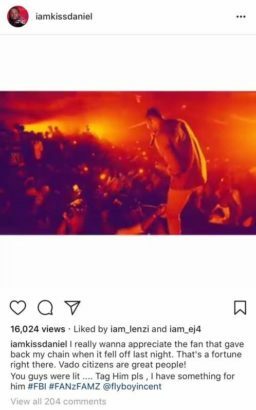 As at the time of sharing this post, the singer, Kiss Daniel is in search of the fan, whom he was not able to immediately establish contact with as the performance was still going on. 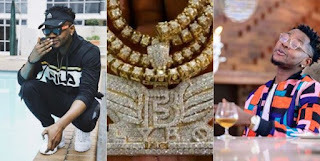 Apart from almost losing a fortune in form of necklace judging by the huge amount involved, the singer who was recently slammed by Cool FM OAP Daddy freeze for wearing fake Louis Vuitton rope is currently enjoying life as reports reaching us from a well known website just confirmed to us that the singer is now a proud owner of a house worth N80 million in Lekki.